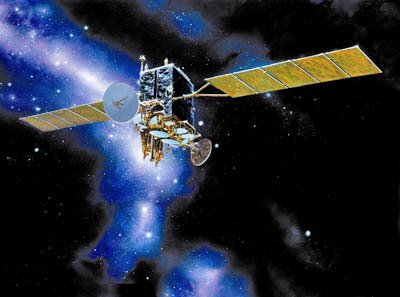 A rescue plan is being implemented to salvage the U.S. military's pricy new communications satellite despite a serious malfunction that knocked out its main engine and stymied the craft's maneuvering ability. The Advanced Extremely High Frequency 1 spacecraft was launched into a preliminary orbit by an Atlas 5 rocket on August 14 from Cape Canaveral, Florida. The United Launch Alliance-built booster performed its job as designed and successfully deployed the 13,420-pound payload into a supersynchronous transfer orbit with a high point of 31,200 miles, low point of 140 miles and inclination of 22.2 degrees. Plans called for the satellite to fire its 100-pound-thrust Liquid Apogee Engine three times over the course of several days to raise the orbit's low point to 11,800 miles and reduce the inclination to 6 degrees relative to the equator, achieving an intermediate orbit. From that point forward, the craft's exotic electric propulsion system using Hall Current Thrusters would be fired almost continuously for weeks to finish shaping the orbit into a circular, geosynchronous altitude 22,300 miles high and inclined 4.8 degrees. AEHF 1 was expected to reach its on-orbit testing location at 90 degrees West longitude over the equator within 105 days of liftoff. But those plans were thwarted a day after launch during the initial orbit raising burn when the satellite's main engine shut down shortly after ignition for still-unexplained reasons. Another attempt tried August 17 also ended immediately when the engine again failed to generate the expected acceleration. With the Liquid Apogee Engine system considered unusable, satellite-builder Lockheed Martin, the Air Force and the Aerospace Corp. support team started devising a makeshift strategy to save the satellite's mission. "We've got 10 of the best orbital mechanics in the country working on this problem and I have confidence in their abilities and what they've shown me to date that we a have credible plan to get there," said Dave Madden, Military Satellite Communications Systems Wing program director at the Air Force's Space and Missile Systems Center. Besides the main engine and the electric thrusters, AEHF 1 also features tiny 5-pound-thrust hydrazine motors. Those small devices can provide the heroic push that AEHF 1 needs to start climbing toward its intended destination. The first maneuver occurred Sunday, lifting the low point of the satellite's orbit during a 40-minute burn. The craft currently resides in a highly elliptical orbit ranging from 265 to 31,000 miles, looping around the planet once every 15 hours, according to satellite-tracking hobbyists. "The satellite performance before, during and after this burn was nominal. We achieved our objectives," Madden said. Several additional burns are planned this week to increase the orbit's low point to 590 miles, getting the satellite safely above the influences of atmospheric drag. The next step will continue employing the thrusters to "more than double" that altitude, Madden said. The electric propulsion system then takes over for exhaustive maneuvering lasting several months to ultimately insert the satellite into the correct orbit. But the switch away from the Liquid Apogee Engine isn't without cost. The small hydrazine thrusters lack the powerful punch that the main engine would have delivered, meaning the climb will take longer and also require the electric propulsion system to fulfill a much larger part of the orbit raising task. The 4.5kW Hall Current Thrusters are ultra-low 0.06-pound-thrust and require lengthy burns to gradually accumulate speed. That patience is rewarded, however, because electric propulsion and the associated xenon fuel supply weigh remarkably less than conventional engine systems, enabling the satellite to fit aboard smaller, cheaper rockets. Madden says AEHF 1 could reach the desired geosynchronous orbit sometime next summer, 7 to 9 months later than scheduled. But the satellite should have enough residual propellant to operate for its full 14-year mission life. "We looked at how much hydrazine and xenon do we need to meet our mission objectives of 14 years on-orbit...We have cordoned off that much of those fuel assets and said this is how much fuel is remaining to work with to do orbit raising," Madden said. "To date, they've come up with a plan that says we can do it." The trade between being miserly with the fuel means the satellite's entrance into service will be delayed many months. Madden said if operators decide they need AEHF 1 sooner than late next year, the orbit raising could be hastened at the expense of shortening the craft's life. AEHF 1 is the first in a new series of national security communications satellites made by Lockheed Martin with help from Northrop Grumman. The spacecraft will replace the aging Milstar satellites in providing vital links that are dependable, jam-resistent and immune from interception. The satellites create the preeminent path of communications between the president, military commanders and troops on the battlefield, plus ensure contact with the U.S. nuclear force and the routing of information to Special Operations. One AEHF has more capacity than Milstar's five-satellite constellation combined and its faster data rates will benefit tactical military communications. Two more AEHF satellites have been constructed for launches in 2011 and 2012. Several more craft are expected to be ordered. The new system has been costly to design and build, however. The Air Force says the current scope of the AEHF contract totals $6.462 billion. For more on the AEHF 1 satellite and its mission, see our earlier story from launch day.